Jack Canon Is All In! Rewind one year, Jack’s focus on redistribution of wealth and energy has made him powerful enemies. Once his friends, Rogue Billionaires, Oil Sheikhs, the Mob, all want him gone. 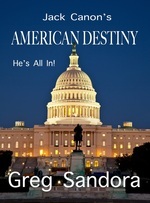 The current President wants him alive–thinking he can win against an unabridged liberal. A Universal Raw Nerve of wealth vs. poverty is exposed becoming a thrill ride as deep machinations of espionage, geo-politics and deception, even murder play out. Kind and charismatic, Jack’s just naughty enough to have you falling for him like one of his loving circle of loyal friends. Of course he’s flawed, a dedicated family man, faithful to one woman, but in love with two. Is it his fault his best friend is impossibly jaw dropping beautiful? Think the crime and passion of the Godfather meets the romance and innocence of Camelot. A story that could spark a movement, a book that can seed a revolution. A heart thumping climax so shocking you’ll pull the covers and draw the shades! One things for sure, through all the drama and suspense, you’ll be pulling for Jack! My Dad and Mom were artists, my father painted and my mother wrote poetry and loved to garden. Most Saturdays we loaded up the 1970 Chevy Impala to trek to a one man show somewhere or other. I took a different track graduating with a business degree; owning and operating an Award Winning Franchise Fitness Center. 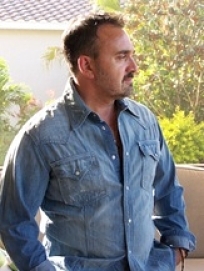 Currently a professional manager I am living in Florida with my beautiful wife and children, and following my passion.Some of my other projects include a children’s book called Sammy the Sea Turtle – about an infant sea turtle taken from his nest the night he was to find his way to the sea. Sammy lives with the family until their son – the boy who took him, graduates from high school. On that day Sammy, backpack in tow – begins the long journey home.My second project in the works involves angels – a man during a visit to Bar Harbor Maine encounters an angel; quite accidentally, he is told – she was not supposed to make him aware of her existence. Only three others have ever seen the real thing. Naturally he falls hopelessly in love with the beautiful creature. 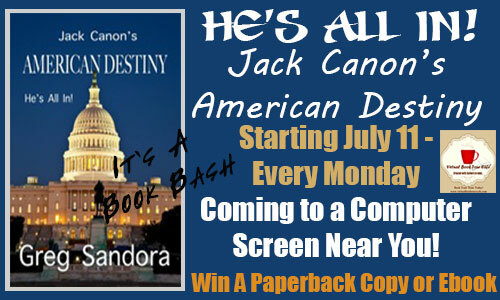 Greg Sandora’s new book, “Jack Canon’s American Destiny” begins innocently enough. Jack Canon, the handsome, wealthy, senior senator from Kentucky has his eye on the presidency. To assist him on his quest, he has assembled a team of dedicated and hardworking staff members, supporters, and family members who are loyal to him to a fault. Not surprisingly, his team includes several extremely intelligent and impossibly beautiful women, including his wife, who have one thing in common. They are all in love with Jack Canon. But although the good senator has a roving eye, he manages to control his libido to a level that Jimmy Carter once described as” lust in his heart.” So far, so good. After a series of complicated maneuvers during the primaries involving an equal measure of political chicanery and sheer luck, it begins to look as though he will reach his goal. At this point, the readers could be excused for tossing aside the book and reaching for a DVD to watch a rerun of “ House of Cards” or “ The West Wing “, but to do so would be a mistake. A big mistake. That’s because a series of clues have begun to appear in the story, scattered like crumbs dropped by Hans and Gretel along the story path. Clues that may not be picked up by readers at first, but clues that Jack Canon’s Camelot may not be what it seems to be. At this point, the plot begins to thicken, and the characters begin to darken. Once a few dirty secrets are exposed, the story swings into a full action mode. Events pile on, one on top of the other, at a rapid pace; a pace that leaves the readers hard put to keep up with the action, but more than willing to try. Meanwhile they know they are being taken to a different place, but they don’t know where. The ending of the book turns out to be totally unpredictable which of course, can’t be disclosed in this review. Greg Sandora is a first class writer. His writing is simple and easy to understand, his dialogue is sound, and his descriptions make characters easy to picture. Best of all, he manages to keep an iron grip on the reader throughout the book. And last but not least, he kept the best for last. That is what story telling is all about. This book is “a keeper”, and I recommend that everyone reads it. It’s a five star book for sure!